Failing to understand the Adivasi world view and imposing the dominant development paradigm on Adivasi peoples is affecting their identity and well-being. The mainstream development paradigm has aggravated discontent among Adivasi communities. The reasons are not difficult to recognise—it encourages the siege of native resources, drives competition, is surplus-driven, instils private ownership, and consequently, is affecting the cultural identity of Adivasi peoples. "We have already been decimated and subjected, and we have been victims of the integrationist policy of governments and the national state," said indigenous leaders, as they rejected the new Brazilian government’s proposals and measures focusing on indigenous peoples. The planet's roughly 350 million indigenous peoples took notable steps on the international stage in the last decade. 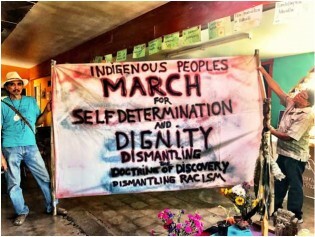 They got the world's governments to agree to create a body to represent them at the United Nations, the Permanent Forum on Indigenous Issues, and to appoint a special rapporteur responsible for their human rights. In 2007 a Universal Declaration on the Rights of Indigenous Peoples was approved by the UN. Yet the living conditions of most "tribal", "aboriginal", "native" or "first" peoples remain precarious. IPS, with its network of contributors at the UN and linked to indigenous communities worldwide, is committed to tracking the world community's efforts to do justice to the rights and aspirations of these peoples, with a special current focus on Latin America's 40 million rural indigenous peoples.